Heart Friends Around The World Get Heart Better is a psycho – energetic – informational approach based on the brain heart consistency through breathing, awareness and BQH transformation. HFATW Get Heart Better uses the research of Heart Math and the scientific exploration of Quantum Mind through the Burgarella Quantum Healing (BQH) method. HFATW Get Heart Better is a program that provides free training for cardiologistsparticipating in the association and a training for health personnel who will take care of the management of the patient with myocardial infarction or operated to the heart in the first and second phase of cardiological rehabilitation. It is also useful in the clinical stability phase following a heart failure. The HFATW Get Heart Better program will then be performed at home by the patient, returning to the third phase of rehabilitation and secondary prevention programs. With the appropriate measures, it also lends itself to be useful in primary prevention of chronic diseases as it has been demonstrated its validity in the control of mental and emotional stress and in increasing, through the brain heart consistency, the Heart Rate Variability, measurable and referable to the health of the heart. Once the consistency of the heart is obtained, it is possible to increase the resilience to the state of illness through awareness, mainly obtained through meditation on the present moment and the acceptance without judgment of cenesthetic, auditory perceptions and compulsive thoughts that may appear during practice. The part of scientific exploration related to Quantum Mind is based on the ability of operators to perceive the biofields with the second attention, to enter the state of awareness of non-awareness, such as the one existing in the space between two thoughts and to make the transformation on the basis of intention, an innovative process based on the ability to have experience of bringing the principles of quantum physics into clinical practice. With the appropriate training all the health workers involved in the first and second phase of rehabilitation can achieve the desired results. The patient, after the teachings received, will be able in turn to retrace the various steps of the method, stabilizing the results obtained over time. The foundation of the HFATW Get Heart Better program is based on heart-centered breathing while feelings of acceptance about appreciation, gratitude, compassion, and healing are felt. After a short time of practice you automatically enter the “field of the heart” that can be appreciated, with the BQH perception, like an oscillatory movement, a cradle, consisting of two points at the antipodes, represented by the oscillation relative to the sistolic and diastolic movement of the heart. The perception of this field leads to a slight altered state of consciousness, to the increase of HR Variability and to the heart – brain coherence. When we are aware of the field of the heart, we exploit the state of coherence present here, which corresponds to the coherence of the unified field, that is, to the conscious vibration at the base of the “physical” universe. The field of the heart has a toric shape and represents a torsion field, in its composition of spin up (+) and spin down (-). This is a field that has the property to propagate in space and to interfere with the material objects for the exchange of information. Thus, dwelling in the field of the heart dwells in a quantum field, in a reality with unlimited potential. This field also has morphogenetic characteristics, as it is located inside and around a morphic unit, at the heart, which organizes its characteristic structure and activity. The field of the heart with morphogenetic characteristics has its own intrinsic memory which, if taken up, can be useful in the morphogenesis process, in making its contribution to the regeneration of cardiac cells. The HFATW Get Heart Better program was presented for the first time to the scientific community and population on September 29, 2018, during the World Heart Day, organized by the World Heart Federation, of which Heart Friends Around The World is a member. World Heart Day ended. Heart Friends Around The World presented its new program “GET HEART BETTER, make your heart better”. There will be training courses for cardiologists participating in the Association and an Open Day to the population at the Selene Medical Center of Bergamo, Italy, on Wednesday 24 October. For information 39.3391119863. 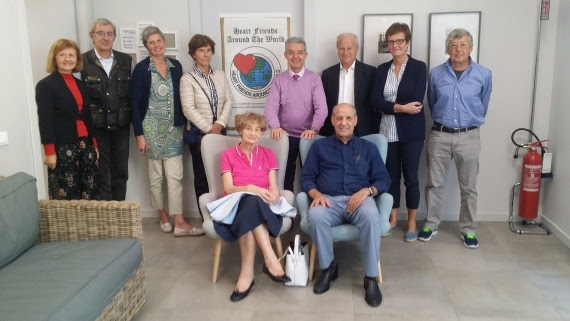 Heart Friends Around the World (HFATW) is an international organization and an affiliated member of the WHF that promotes CVD prevention worldwide through a membership network. We are very happy to invite Heart Friends Around The World to give a presentation in the Arena, which is an interactive auditorium located in the heart of the exhibition hall. In terms of available technology, we will have standard AV: screen (projector), laptop, microphone. Kindly let us know for long would you need the space, so as I can tell when the room is available. We have 15 minutes time slots, but we can also combine them in case you need more time. I look forward to seeing you in Dubai! I would like to follow up on my previous email and inform you about the time slots. It’s also feasible to block a slot for more than 15 minutes, for example we can block for you the morning on Thursday, from 11:05 until 11:45, so for almost 40 minutes. Tel. : +41 22 807 03 24 | E-mail: andreea.dragus@worldheart.org | www.worldheart.org. La Sociedad Iberoamericana de Prevención y Rehabilitación Cardíaca nace en el año 2000 con su primer congreso en la Habana Cuba con el Dr Eduardo Rivas Stany como Presidente y con la colaboración de la Asociación Mundial Amigos del Corazón Alrededor del Mundo. Esta asociación, miembro de la WHF, tiene por finalidad fomentar el intercambio científico, los vínculos fraternales y el contacto intelectual, para propiciar la participación y fomentar la educación contínua de los médicos y afines al área de la salud (fisioterapeutas, nutricionistas, licenciados en educación física, enfermeros y psicólogos entre otros) en la rehabilitación y la prevención primaria y secundaria cardiovascular. Nuestro objetivo fundamental es motivar a todo el equipo de salud a participar en la prevención cardiovascular en forma activa. El IX Congreso se llevará a cabo, este año en la ciudad de Manta-Ecuador organizado en conjunto con la Sociedad Ecuatoriana de Cardiología Núcleo Manabí. Los campos de torsión del corazón y la comunicación con la conciencia universal en el “entaglement” cuántico. Los amigos del corazón al rededor del mundo desde la prevención a la rehabilitación y a la regeneración de las células del corazón. Affiliated to the World Heart Federation since 1994 and founded by Dr Flavio Burgarella, Heart Friends Around The World (HFATW) is an international movement to create awareness about heart diseases in the most affected countries.The organization brings together physicians, cardiologists and patients worldwide, predominantly from low- and middle-income countries, to promote the prevention, treatment and control of cardiovascular disease. It also considers the education of women as a priority for family health. “HFATW is involved in promoting awareness about heart ailments in the most affected parts of the world. Our flagship conference, Cardiology Update, which was held in 2013 and2016 in Kolkata India, is a unique concept; to bring together the best minds in the field of cardiology to share and exchange their knowledge and general expertise with fellow doctors, heart patients, their kin and care takers.